Breeders specialize in leopard geckos and are a lot better quality than Petco or Petsmart. One of the nicest things about buying from breeders is you can browse their selection from the comfort of your own home. I have spent several days talking with different leopard gecko breeders, browsing websites, etc. and have compiled a top 5 list of leopard gecko breeders. 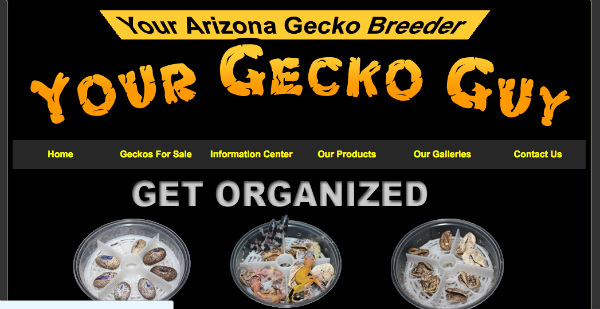 Geckosetc.com is my top choice for purchasing leopard geckos online along with snakes, too. I purchased Shrek (my rainforest albino) from them. Steve and Debra Sykes have been running their breeding business since 1996 (20 years). They are based near Sacramento, California. There are a wide variety of leopard geckos offered on their website. Currently, there are over 100 morphs of leopard geckos you can purchase on their website. Leopard Geckos are going to cost you anywhere from $60 to $800. If you’re on a tight budget there is a special section of leopard geckos for sale that are under $150. You can reserve your gecko for up to a month in advance. They ship these reptiles FedEx Priority Overnight. Geckoboa.com is an excellent place to purchase leopard geckos. John and Alyssa have run this site since 2010. They are based in Colorado. They have a variety of leopard gecko morphs. The prices range from $20 to $750. They have a special section on their site where you can get an excellent “pet” only leopard gecko for $20+shipping. They have all kinds of leopard gecko video tutorials and lots of helpful information on taking care of them. All orders must be paid through Paypal, checks, and cashiers checks. One nice thing about Geckoboa.com is you can do a payment plan for your leopard gecko if it cost over $100. It must be paid in full within 30 days. They ship FedEx Priority Overnight. 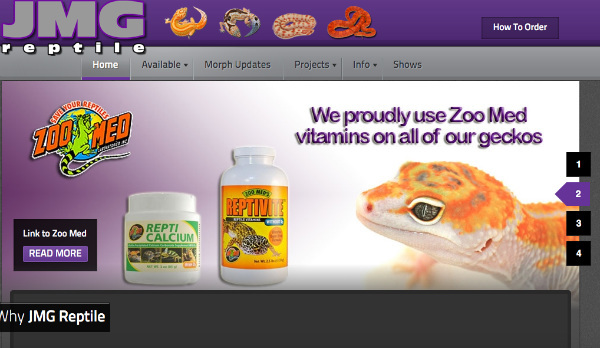 JMG Reptile is an excellent website to buy leopard geckos. They’re a father and son business run by Jeff Galewood Sr. and Jeff Galewood. They are based out of Hudson, Ohio. They certainly know their leopard geckos, seeing how they have 45 years of experience breeding them. They have 12 different morphs of leopard geckos for sale. The prices range anywhere from $75 to $1450. All of their orders ship UPS overnight. They will ship to the United States and also the United Kingdom and Germany. For payments they accept Paypal, money orders, cashiers checks, and personal checks. You can hold leopard geckos for 2 weeks if you would like. 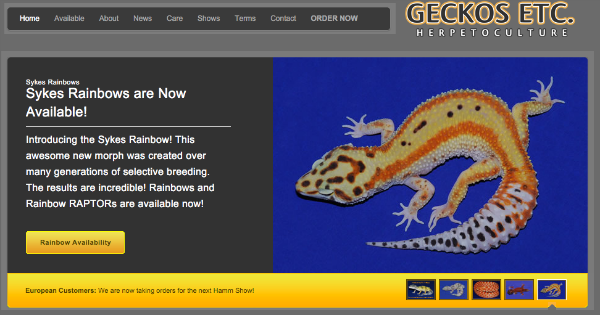 This is an excellent website to buy your leopard geckos online. This is a breeder that is based out of Arizona. There is lots of helpful information on their site about caring for leopard geckos, YouTube videos, and even a cricket caresheet. They have a variety of reptile projects they are working on. You can even buy products for your breeding projects there. 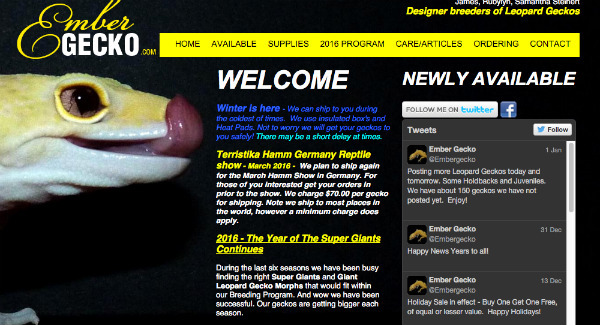 They don’t give the prices for their leopard geckos on their site, though. Instead you need to contact them for the prices. All of their leopard geckos are shipped out on Monday, Tuesday, and Wednesday. They use FedEx overnight to ship their geckos. This is an amazing leopard gecko breeder. It is operated by James, Rubylyn, Samantha Steinert. They offer lots of different leopard gecko morphs; including a ‘specials’ section where you can get their designer geckos for cheaper. The prices for these geckos are between $100 and $600. They are based out of Nampa, Idaho. They have a handful of helpful articles on their website. You can purchase their leopard geckos, reserve them, and even do a payment plan if you don’t have all the money upfront. They will not ship the leopard gecko until it’s paid in full though. They ship all their leopard geckos out on Tuesday and Wednesday. They accept credit and debit cards, PayPal, money orders and cashiers checks. NextCalcium Sand For Leopard Geckos? Do not support geckos etc. They are breeding ‘Lemon Frost’ geckos. That color/morph is known to have an incredibly high rate of genetic deformities and health problems. Any educated and responsible breeder would not sell them. Ember Gecko has many comments in the board of inquiry on faunaclassifieds you should check it out before you buy anything from them, bad genetics, terrible customer service. Stay away from ember gecko, the genetics are wrong way too much. Also urban gecko has high crypto rates. OK, I will remember that about ember geckos.